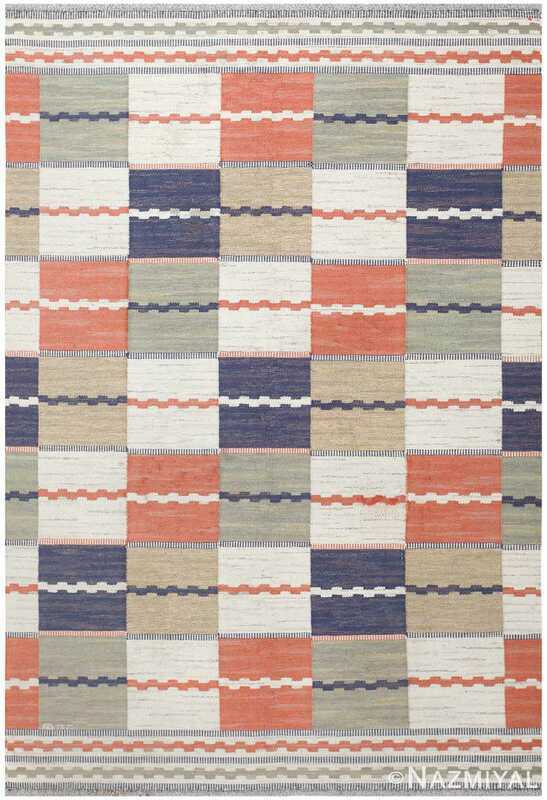 This sophisticated antique Swedish Kilim features a charming variety of geometric patterns with crisp lines and bold colors that embody a chic industrial-era style. 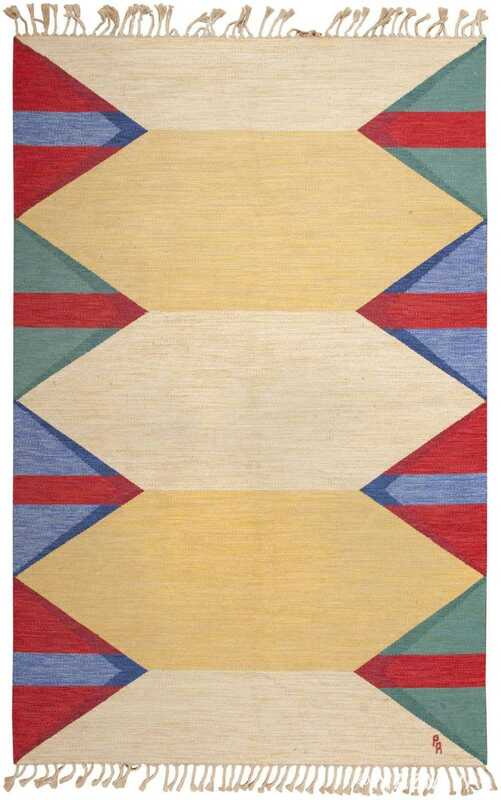 Vintage Swedish Kilim, Origin: Sweden, Circa: Mid 20th Century – This magnificent vintage Swedish Kilim features a phenomenal geometric composition comprised of many distinct patterns and components. The precisely drawn field on this vintage rug showcases an assortment of broad stacked lozenges with zigzagging accordion-fold outlines that are rendered in alternating hues of manila yellow and ecru. Bold, clear colors and geometric patterns line the zigzagging edges of the striking composition. The graphic geometric triangles are rendered in contrasting colors, placed at varied intervals and decorated with lively opposing hues. Directional bars with chevron-shaped ends fill in the negative space created by the tribal edge pieces and central lozenges. 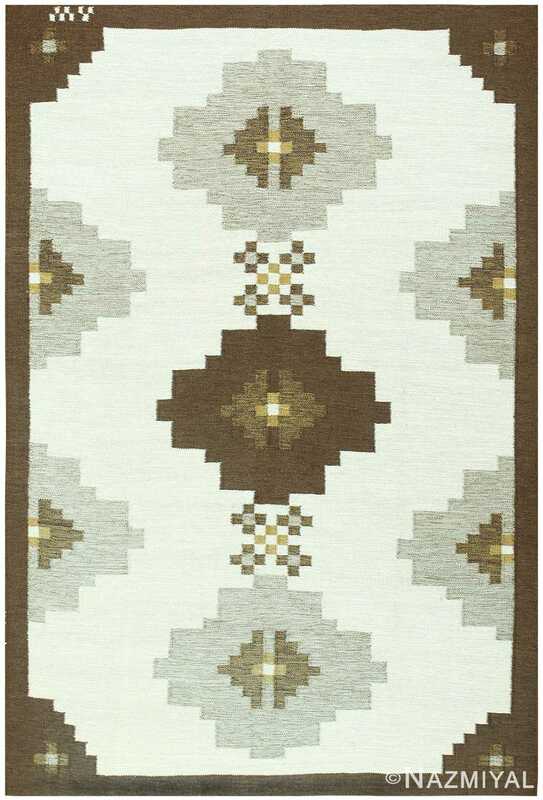 Inset slopes rendered in darkened colors create dimensional accents that emphasize the streamlined, modern style of this stunning antique Swedish kilim. 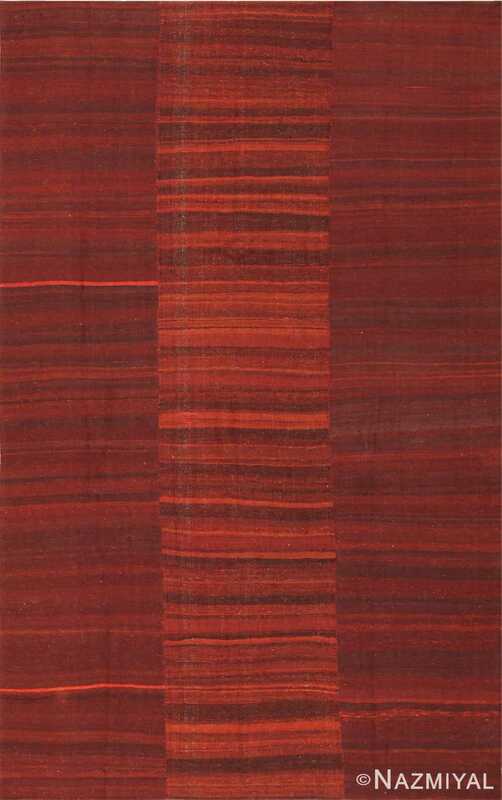 This dark, warm antique Mazandaran kilim has a powerful masculine aesthetic with mineralic veining and warm wood-grain patterns that have a dazzling effect. Espousing some of the finest traits of mid-century Swedish rugs, this lovely example boasts a high contrast pallet as well as beautifully rendered geometric detail throughout.